I have always loved watching ice skating, my family of boys not so much. 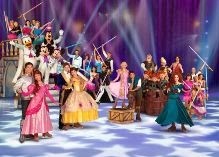 I found the perfect show we can go watch together to make it exciting for them and for me to watch ice skating, Disney on Ice! We just got back from our vacation at Disneyland so this will be a fun way for my son to remember the magic of Disney. Feb 12-17, 2014, Sleep Train Arena Get ready to rock out with some of the most magical idols of all in a musical showcase that features the hottest tunes and talent from across the kingdom in Disney On Ice presents Rockin' Ever After! Jam to a Scottish jig as a group of royal contenders from the latest Disney/Pixar film, Brave, competes to win the heart of headstrong, sharp-shooting Merida, making her ice debut! Experience a show-stopping performance as Sebastian breaks out of his shell for one night only to make waves with Ariel. A chorus of harmless hooligans from Tangled unleashes musical mayhem when they get a visit from the sassy and spirited Rapunzel and her charming ally Flynn. And, get your feet moving as the Beast and his castle's enchanted entourage take center stage in a spectacular show for Belle. 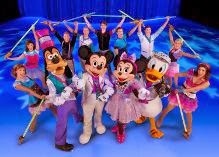 We will be attending the opening night of the Disney on Ice Rockin' Ever After and I will share my review of the show. I know there are many princesses in this show but I know my son will enjoy all the action and fun. I look forward to sharing my thoughts on the show. Disney on Ice presents Rockin Ever After at Sleep Train Arena in Sacramento Feb 12-17 you can buy tickets for this event online at Ticketmaster. *This is not a paid post. I will be provided tickets for my family to attend.